The WebSphere nomenclature is sometimes i bit confusing. In this post i will explain the mostly used terms. 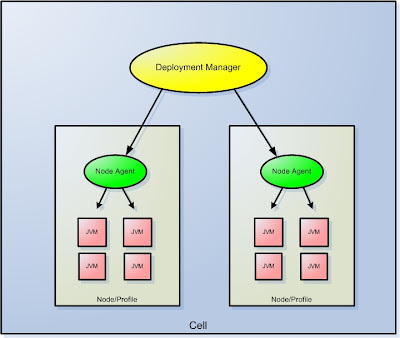 A Cell is a logical group of all nodes and there deployment manager. A node is a group of profiles. Typically one node represents a physical server. However its possible to install/run more than one node on a physical server (through profiles). A Node agent is managing a node. The node agent is needed to access the applications. A JVM (Java Virtual Machine) is a Java-Process containing the installed applications. A Deployment Manager manages the node agents. A Dmgr-Profile contains the configuration for the entire management domain (cell). The Administrative console runs inside the Dmgr. If the dmgr is down the applications are still avaiable over the respective node agents.